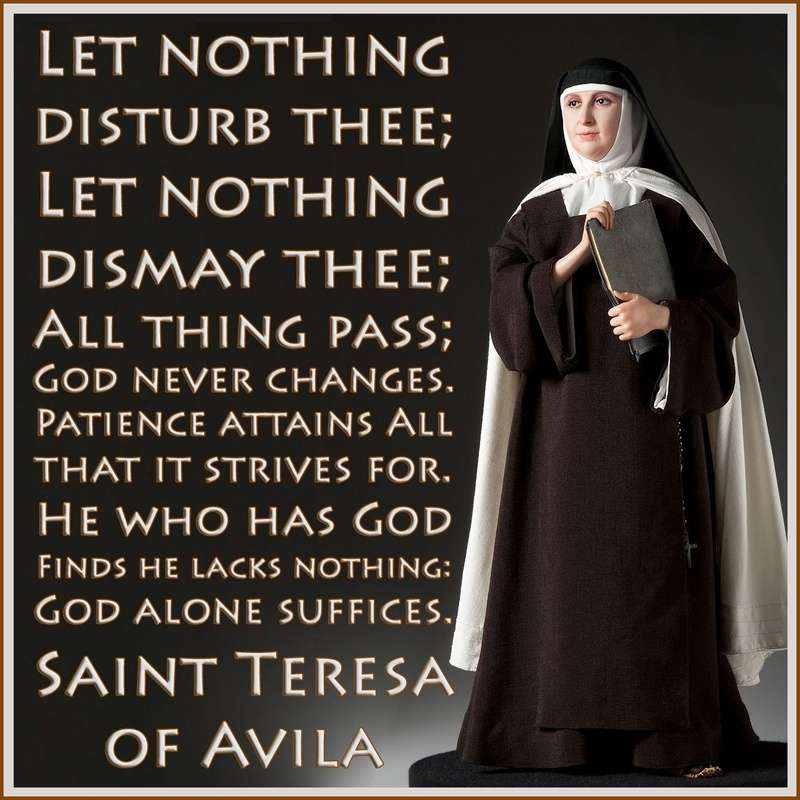 Today is the memorial of St. Teresa of Avila, also known as St. Teresa of Jesus. Representing the mystical branch of Christianity, St. Teresa embodied and taught that the concept of divine grace is bestowed as a gift. Nothing we do can earn this gift. It is freely given by God. But she also taught and wrote about being prepared for that gift. And it is in her preparation for God’s blessing that we see her “works”, if we may call them such. Throughout her teachings, St. Teresa presented the ascent of the soul to God in four stages: 1. Devotion of Heart, devout concentration and contemplation. 2. Devotion of Peace, surrendering to God all our being and all our thought in quiet prayer. 3. Devotion of Union, an ecstatic state of further absorption in God, or rapture. 4. Devotion of Ecstasy, wherein all of our senses and mental faculties are completely entranced by the love of God. While a true contemplative, St. Teresa was a tireless reformer, teacher, writer, and founder of Carmelite monasteries. So she was out and about, without shoes since she was a discalced religious, working fervently for the unification of the Order and to establish as many houses as she could. She also lived in extreme poverty, renounced property, and practiced flagellation. In today’s first reading, St. Paul is giving thanks for his brothers and sisters in Ephesus who have shown him their faith in Jesus. And Paul prays that they will receive from God a spirit of wisdom and knowledge of him. This is essentially St. Teresa’s first stage that they are in and Paul is praying for their advancement to a higher level. The Psalm and the Gospel may be seen as the beginnings of the second stage, the Devotion of Peace, essentially a surrendering. Jesus tells us that when faced with having to defend our beliefs, we need only surrender to the Holy Spirit who will teach us at that moment what we should say. Let me go back to the idea of preparation. In another of St. Teresa’s works, The Interior Castle, the saint is recording for us the path to mystical union with God. Like St. Ignatius of Loyola, she is giving us a prescription to follow, in an orderly way, so that we may receive the full majesty of God’s grace and glory. These exercises, as St. Ignatius called them, are work we must do to have the strength to move into the realm of ecstasy. Yet, as in the readings, and as St. Teresa said time and again, we cannot “earn” God’s grace; it is always freely given. We must only be ready to receive it. Isn’t this always the conundrum? So embedded in our minds and psyches is the notion that we must earn our daily bread, we must work hard to get ahead, we must never give up, so embedded is this that it seems that all good things come only after struggle and toil. This “valley of tears” is only something to be overcome, to be slogged through, to be endured. Of course it is. This is real life! But what Jesus and St. Teresa and all our spiritual teachers are telling us is that no matter how hard we struggle, we can rest easy in the knowledge that we are in God’s hands. And what they are suggesting is that we put ourselves in grace’s way. We pray, we contemplate, we study, we patiently wait, we open the eyes of our hearts that we may be enlightened, as Paul says in the Reading. Let us pray. Lord, give us the courage to prepare for your presence, give us the stamina to exercise our souls for the day of your coming, and give us the time and the peace to be ready for the manifold distribution of your gifts. We ask this in Jesus’ name.